What: So often timing is everything, several months ago the Children’s National Medical Center in Washington, D.C. enhanced its Celiac Disease Program to include a psychologist, Dr. Aaron Rakow, and group therapy/support group sessions for children through their teens. If you’re the parent of a gluten-free child, you know that there are many psychological and social impacts of the gluten-free lifestyle. Even as gluten-free adults, we well know the challenges in these areas. Dr. Rakow contacted me to ask me to spread the word of this facet of NCMC’s program and when I agreed, I, in turn, asked him to speak at our open house event. Thankfully, he said yes! So Dr. Rakow plus the chairperson of the program’s board of directors, Blair Raber; the program coordinator, Vanessa Weisbrod; and the program dietitian, Cheryl Molinatto; will all travel from D.C. to join us for our annual open house event. They’ll be discussing the celiac disease program at CNMC in general as well as highlighting their upcoming CD support groups for children and adolescents. Beverages and gluten-free treats and snacks will be provided. I am asking all of our members to help me with those please. And also, of course, please spread the word on this event! I have sent out a flyer to all on my distribution list, but if you need one, please email me. Please spread the word on the Children’s National Medical Center’s Celiac Disease Program and join us on Sunday, January 27, to learn more, sample wonderful gluten-free treats, and even get a chance to win some great door prizes. They include a New to Gluten-Free pack from Jules Gluten Free, which is valued at $130; a package of gluten-free products from Taste Guru (a company which provides gluten-free gift boxes to subscribers each month); and a package of gluten-free products from Goldbaum’s. 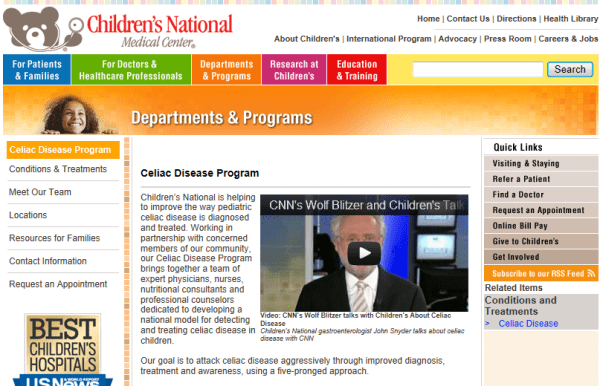 To learn a little more about the National Children’s Medical Center (NCMC) in Washington, D.C., watch the video below of a segment on Wolf Blitzer’s The Situation Room about the NCMC program that includes representatives from the center’s celiac disease program: Dr. John Snyder (pediatric gastroenterologist; Division Chief, Gastroenterology, Hepatology and Nutrition) and Vanessa Maltin Weisbrod (who was mentioned above; note that Vanessa has celiac herself and is also the editor of Delight Gluten-Free magazine and author of The Gloriously Gluten-Free Cookbook). Dr. Snyder and Vanessa were joined by CNN production assistant, Sarah Marx, who also has celiac. In summary, this whole event will be perfect for anyone who is gluten free now or who is considering living gluten free!